This morning I finished listening to Episode 5 of Data Stories: How To Learn Data Visualization. Data Stories is a bi-weekly podcast on data visualisation produced by Enrico Bertini and Moritz Stefaner, episode 5 also featuring Andy Kirk. For anyone interested in Data Visualisation I’d highly recommend you give it a listen. Like many others I’m at the beginning of my data visualisation journey, one of the things this episode highlighted was there is a whole world of data visualisation experts out there that I’ve yet to start stealing learning from. Fortunately today another Visualisation expert, Nathan Yau (FlowingData), posted his list of Data and visualization blogs worth following. Perfect! I could’ve gone through the list and individually subscribed to each of the blogs feeds but I’m lazy (so lazy that a 15 minute hack has turned into a 3 hour write-up <sigh>) and just wanted to dump them into my Google Reader. 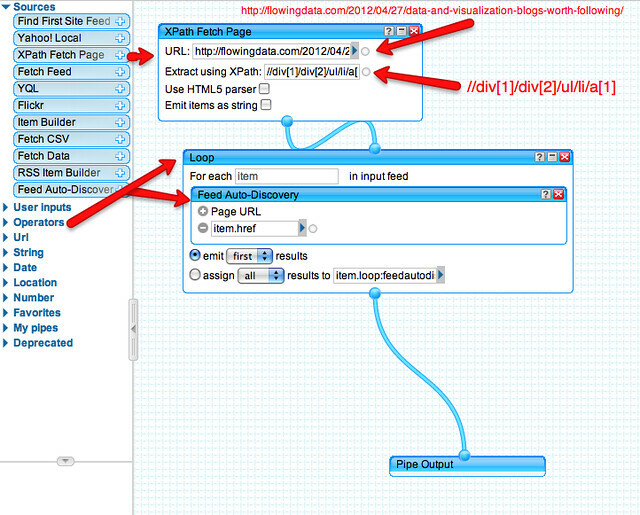 This is a problem Tony Hirst has encountered in Feed-detection From Blog URL Lists, with OPML Output. One thing that is not clear is how Tony got his two column CSV of source urls. There are various tools Tony could have used to do this. 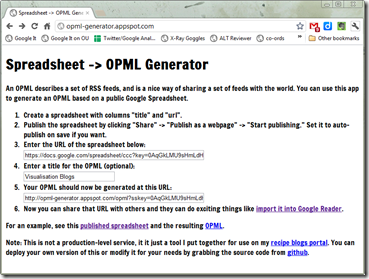 Here’s my take on converting a page of blog urls into an OPML bundle. In the window that opens you should get something similar to the one below. Scraper has two options for identifying the parts of the page you want to extract, XPath or JQuery Selectors. Both of these have similar coding structures but for this example I’m going to stick with XPath. XPath basically provides a way to identify parts of the XML/HTML structure and extract content (if you are not familiar with XPath the w3schools is a great starting point). So basically we need to switch a to a and ul to ul e.g. ‘//div/div/ul/li/a’. Edit the XPath query and in the columns section beneath change the order by clicking and dragging so that @href/URL comes first. Clicking on the ‘Scrape’ button to get a new preview which should now contain a list of 37 urls. 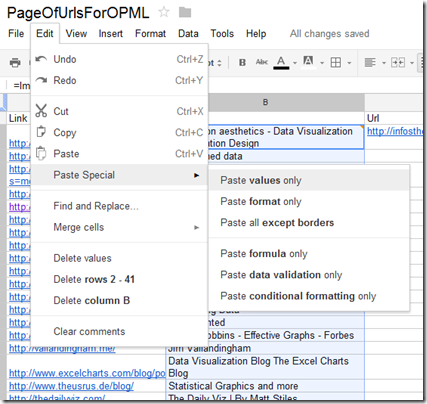 Click on Export to Google Docs … You are now ready to move to Step 2 Auto-discovering feed urls below. Another way to get this data is to directly scrape it using Google Spreadsheets using the importXML function. This function also uses XPath to extract parts of a webpage so we can reuse the query used in Method 1 but get the data straight into a spreadsheet (it’s also a live link so if Nathan adds a new link the spreadsheet will automatically update to include this). Let give it a go. Now select cell B2 and fill the column down to get titles for all the urls. Finally we need to select the entire B column and Copy/Paste values only. The reason we do this is Google Spreadsheets only allows 50 importXML function per spreadsheet and we’ll need 37 more to get the RSS feeds for these sites. Fill cell C2 down the rest of the column to get RSS feeds for the other urls. You’ll notice that there’s a #N/A for http://neoformix.com/ this is because their feed isn’t auto-discoverable. Visiting their site there is a XML link (http://neoformix.com/index.xml) that we can just paste into our spreadsheet (tiding data is a usual processes in data visualisation). And because I’ve imported these into Google Reader here’s an aggregated page of their posts. 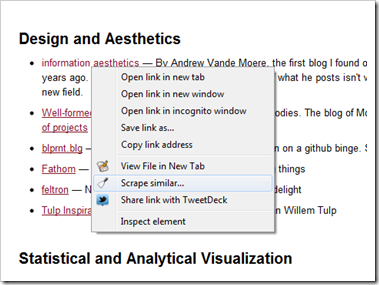 Previous Post: Google Docs defaults to searching for Creative Commons licensed images. Great, but could they do better?